Each $44 box contains 16 packs. Each pack contains 7 cards. The Cardfight!! Vanguard G NEXT animation is moving on to the Second Stage of the Under 20 Championship!! Characters from the protagonist team and rival teams will be using new trump cards from Demonic Advent too! 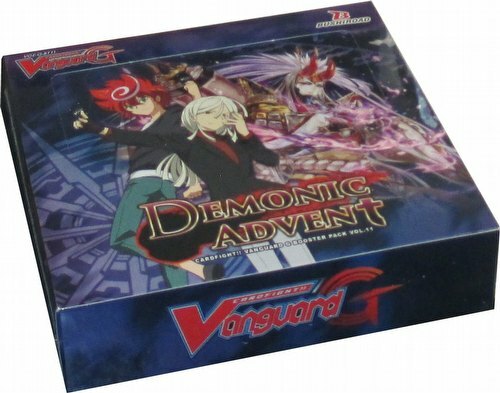 This set features many cards that can directly strengthen the Nubatama Trial Deck, Evil Eye Sovereign. Additionally, the popular SP Clan pack will be randomly inserted in displays! The set includes 104 cards (98 new cards and 6 reissued cards) - 2 GR, 9 RRR, 13 RR, 24 R, and 56 C, plus 12 SP Parallels, 2 SGR Super GR Parallels, 3 Special Reissues, and 35 SPs from Clan Packs. There are 16 packs per box. 2 cards in every pack will be Rare or better!